The monument is a statue of Marquis de La Fayette standing tall with a sword at his side and a scroll of paper in his outstretched hand. The monument stands in Cross Creek Park and is surrounded by a circle of greenery. Dedication Date April 9, 1983. 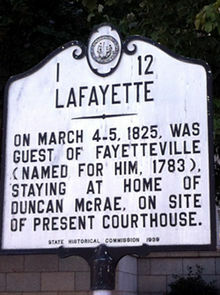 The town was incorporated in 1783 as Fayetteville in honor of the Marquis de La Fayette. 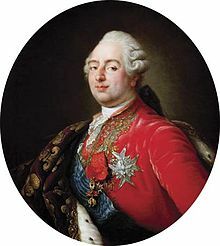 It was the first city to be named in his honor in the United States. 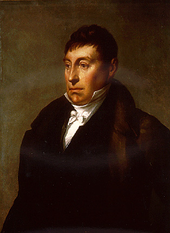 Lafayette visited the city on March 4 and 5, 1825, during his grand tour of the United States. Asheville, NC – Lafayette Ave.
Clinton, NC – Lafayette St.
Elizabeth City, NC- Lafayette Ave.
Fuquay Varina, NC – Lafayette Rd. Greensboro, NC – Lafayette Ave.
Grifton, NC – Lafayette Rd. Hudson, NC – Lafayette Ave.
Lumberton NC – Lafayette St.
Rocky Mount, NC- Lafayette Ave.
Salisbury NC – Lafayette St.
Shelby, NC – Lafayette St.
Wilmington, NC – Lafayette St.
Winston-Salem, NC – Lafayette Ave.
Winterville, NC – Lafayette St. The 13 states involved: Connecticut, Delaware, Georgia, Maryland, Massachusetts (South and North), New Hampshire, New Jersey, New York, North Carolina, Pennsylvania, Rhode Island, South Carolina, Virginia. • October 22 – Norfolk, VA and Portsmouth, VA.
• November 4 –Monticello, VA (former President Thomas Jefferson). • Early December – Washington, D.C.
• December 15 – Washington, D.C.
• December 17 – Annapolis, MD (visits Fort Severn). • December 24 – Frederick, MD. (« Jug Bridge » crossing the Monocacy River on the National Pike). 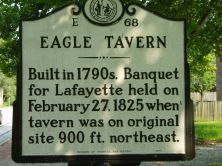 • February 27 – In the morning, Lafayette traveled about twenty miles to Northampton Court House (now the town of Jackson) where he met up with the official North Carolina greeting party and stayed at Eagle Tavern in Halifax, NC. • February 28 – The party traveled through Enfield, NC with a brief stop at the home of Joseph Branch and across the Tar River at the falls (the falls are at present day Rocky Mount). They spent the night at Col. Allen Rogers’s Tavern at Rogers Crossroads in eastern Wake County. They soon moved on to Raleigh, NC. 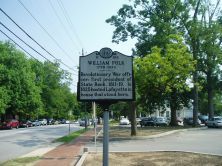 (The party across the Tar River at the « Falls » present day Rocky Mount). 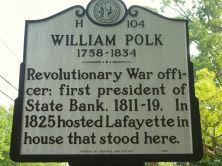 • March 2–3, 1825 – Stays in Raleigh, NC: Lafayette is reunited with Colonel William Polk who fought beside him at the Battle of Brandywine where both were wounded. Lafayette is reunited with Colonel William Polk who fought beside him at the Battle of Brandywine where both were wounded. • March 19 –Savannah, Georgia. • March 27 – Milledgeville, Georgia (capital of Georgia since 1804). Night at the Gachet house, Lamar County/Georgia.